Felicita L’Originale is not only a restaurant but also a pizzeria. 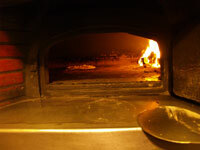 As one of the few in the Czech Republic it is equipped with a wood-burning oven. The baking technique together with the original Italian recipes ensure the quality and typical taste. You can enjoy our pizzas in different variations which will satisfy all your desires. Pizza is served independetly on the dishes prepared in the kitchen. You can order pizza on phone number +420 495 593 088. Pizzeria Felicita at Hradec Králové is here for you.